Home › Dirty Politics › Pork-Barrel Politics in Singapore? According to Wikipedia, Pork barrel is a derogatory term referring to appropriation of government spending for localized projects secured solely or primarily to bring money to a representative’s district. The term pork barrel politics usually refers to spending that is intended to benefit constituents of a politician in return (and since Singapore is so small, the city is the country itself) for their political support, either in the form of campaign contributions. -Sembawang Town Council to spend $570m on renewal plan (Apr 24 2011) . In GE 2006, the Government dished out its “Progress Package” – money in cash worth a total S$2.6 billion – deposited into Singaporeans’ bank accounts just a week (on 1st May, Labour Day) before Polling Day on 6 May (Source: TOC). According to the The Sunday Times (1 May 2011), 4 in 5 of the 2.4 million adults (voters) will receive $600 to $800. The remainings will receive between $100-300. 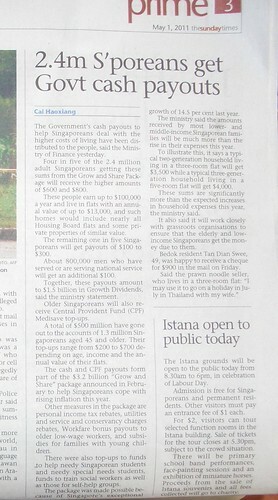 The cash payouts are “to help Singaporeans to deal with higher costs of living”. The intention may be sincere and noble but the timing is questionable. The nomination day for the election was 27 Apr 2011 and the voting day is 7 May 2011. The cash was deposited by 1 May 2011. A coincidence or vote buying tactics? Thankfully, the upgrading incentive, in its various guises ranging from being an explicit electoral threat to carrot to a subtle promise of change, has not worked at all as shown in the electoral results of Hougang SMC, Aljunied GRC and to a certain extend Potong Pasir SMC. Instead, it offends the sense of fairness and equity, and this has worked to the detriment of the ruling party. is linking HDB upgrading to votes pork barrel politics? THE Government has been accused, sometimes unfairly, of giving ‘election year goodies’ with the right hand before the elections, and taking back with the left hand after the polls [Askmelah’s Note: see an example of how furious forumers are with such tactics here]. I received my Grow and Share package of a few hundred dollars a few days ago, only to then open another letter from the Comptroller of Property Tax. It informed me that the annual value of my property has increased from $19,800 to a whopping $30,000. This will result in $272 in incremental property tax, which just about offsets my Grow and Share dividends. The timing and the magnitude of the increase, and naturally the comparisons to the Grow and Share dividends, which could very possibly be coincidental, will not help allay such public perceptions.